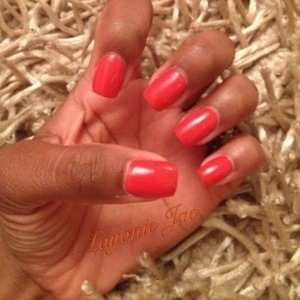 Earlier this week I went to get my nails did again and I decided on a lovely orange colour for a change.. this colour is called Craving Coral do you like? Instead of waiting until it is time for my infill to give my nails the usual Layonie Jae touch which I’ve told you about here, I decided only a couple of days later, to paint one of my nails gold using my trusted gold glitter nail varnish..
Kim Kardashian – Loving Your Hair Honey! !